High ceilings and big rooms can use balloons to fill room with color and sparkle. Plus give visual interest along tall walls. Have a celebration everyone will remember. Theme balloons can be special ordered and balloon arrangements custom designed for your space. 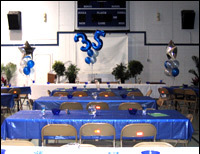 Large balloon trees can be used on tables in large rooms with high ceilings. These are 7 balloon trees with 3 balloons per layer. 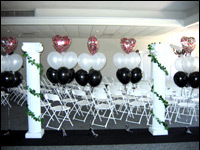 Balloon columns look beautiful around the dance floor. 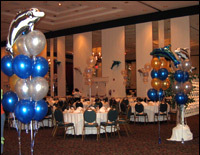 Single tie balloons are placed close to the walls to give color throughout the room without taking lots of floor space. Themed balloons centerpieces bring the party out to the lobby area. Giant shapes and numbers are available. 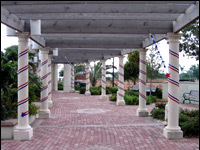 City of Cocoa decorated Riverfront Park with our decorations. This wedding used balloons and columns to form a room divider between the ceremony and the reception.